Autumn is a fantastic time to be in Kyoto, Japan. During this season, leaves change their green coats to varying shades of vibrant yellows, flaming oranges, and deep reds. Famed gardens and ancient trees are prevalent in the many shrines spotted all over Kyoto. I knew I had to be in Kyoto during autumn at least once in my life to witness these autumn colors or kōyō (紅葉) with my own eyes. With that many gardens and shrines in Kyoto, we had to be selective in the places we were going to visit. Time is limited during travels, but isn’t that always the case? Considered as Kyoto’s five greatest zen temples or Kyoto Gozan (京都御座), Tōfuku-ji (東福寺) was found in 1236 and its huge garden, which left an unforgettable mark in my experience and memory, was designed in the 1930s by landscape architect Mirei Shigemori – landscape architect of Tofuku-ji in Kyoto. Even before reaching the main gate where we had to pay our entry fees, towering trees in their glorious reds greeted us. Across the canopy of these trees, we saw temple’s bridge, Tsūten-kyō (通天橋), already packed with visitors. Young maple trees line the path leading to the temple garden. Expectant of older, redder and more Japanese maple trees ahead, some rushed on by. Others took their time strolling to the entrance and enjoying the cool breeze. After paying ¥400 for entry to the garden and bridge, we stepped across the wooden bridge and attempted to get a good spot to photograph the scenery below us. 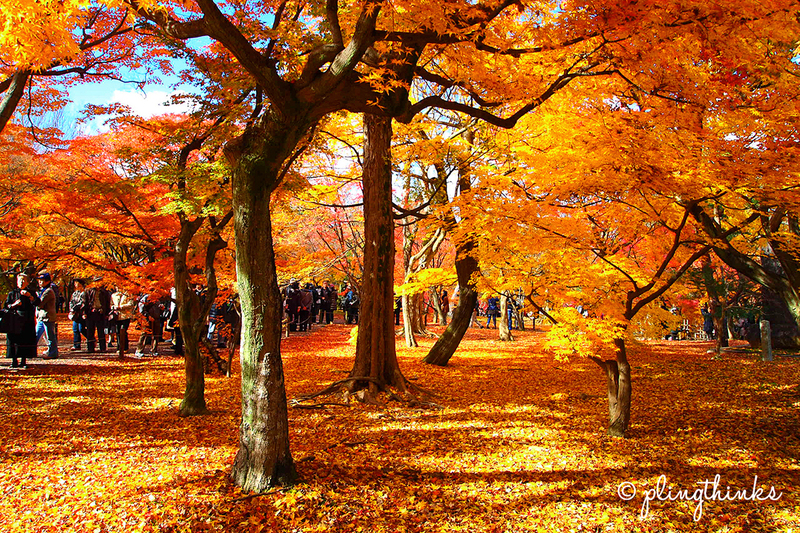 It is difficult not to get elbowed and bumped during the peak autumn season when the leaves are at their reddest. For photography enthusiasts, no tripod is allowed on the bridge. Temple wardens patrol the bridge (Tsūten-kyō 通天橋), making sure visitors keep to their respective lanes and do not lean dangerously over the edge. When we stepped off the bridge, that was when the magic began. It was almost too surreal for this girl from a one-season country to fathom. Such intensity in colors. Such a miraculous symphony of hues. Such a spectacle of God’s ingenuity and nature’s wondrous glory. Low-lying branches arch over carpets of reds, oranges, and yellows. As you look across beneath the branches, you get a sense that you’re bathed in orange-red light. Light beams streamed in between the branches & leaves, casting a magical glow on the lush carpet of fallen maple leaves in a myriad of warm tones. If it had been really quiet, it would have been a scene right out of a dream – surreal, almost unreal. Some of these Japanese maple trees are petite enough for you to touch their soft leaves or take really good selfies. A little stream runs through the garden, crinkling their watery music to calm the soul. Every step or two, you’ll see ladies dressed in kimonos, seeking out scenic spots to commemorate their visit to this awe-inspiring place. This, plus the scenery, made it seem that we might have stepped into a period Japanese movie. pling thinks…it is just spectacular! Not to missed. We walked from Fushimi Inari Shrine to Tofuku-ji, and stopped by a makeshift food stall where we had a simple meal of one of Kyoto’s signature food, yuba (湯葉, tofu skin or 豆腐皮) and udon, enjoying the view of maple leaves fluttering above our heads. From Kyoto Station, take the JR Nara line (Platform 32, 33) to the JR Tofukuji Station (東福寺). Cross the road and turn right. From Gion-Shijo Station, take the Keihan Main Line and alight at Tofukuji Station. From Kyoto Station, take Kyoto City Bus 208 and alight at Tofukuji Bus Stop. Wow, such a nice place. Is this in October this year? Beautiful place! It was in late November to 1st week of Dec, when the maple leaves turned full red. Wonderful Photographs. Just moved here from Toronto. Would like to open a Cafe. Super! Envious that you’ll be living among such beauty. Share when your cafe is open. I might just hop over to visit on my next trip to Kyoto.